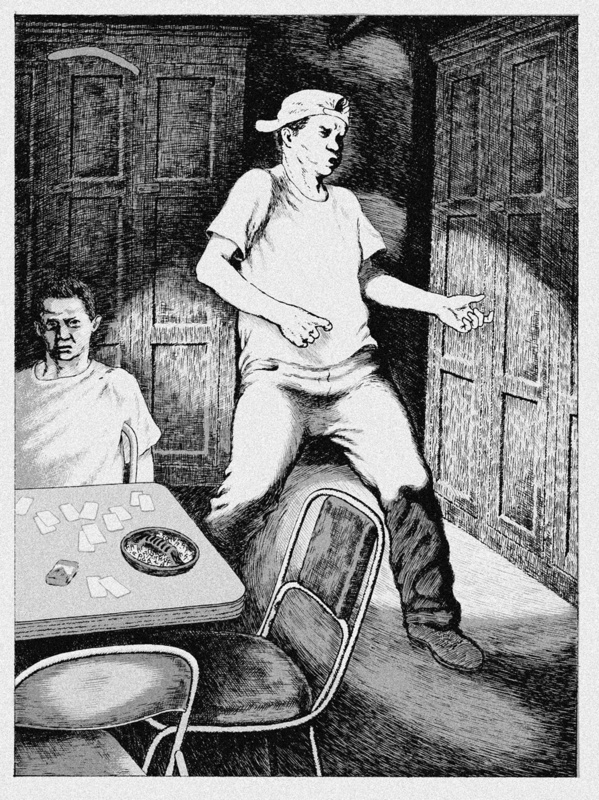 Then Steve and I passed through the room of enormous men dressed in a carnival-variety of obtrusive costumes and walked into another room, where two young men, dressed in ordinary street clothes, sat at a fold-out table under a dim light, playing cards and smoking cigarettes. Steve introduced me to one of these as an expert on automatic weapons, and it didn’t take long for the kid to twist his baseball cap brim-backwards and begin his enthusiastic pontification on the thorny subject. As if turns out, the true automatic weapon of choice for any afficionado would be the M15 something-or-other, with a clip of 75 rounds of Hooligan Brand silver-capped 3-quarter-inched heat-censored impact-exploding bullets, designed and manufactured by the now-defunct Kopek-Balugua government between May and August of 1978, with a special doo-dad that fixes the gun to shoot beyond the regulated blast of three bullets per something-or-other. What ensued was a great deal of dangerous gesticulations: Visual demonstrations of yanking clips out of invisible guns and proper stances and letting a blast rip at some invisible enemy or perhaps harmless victim. I stared at the kid’s hands; few things demand one’s attention like aggressive talk of the formidable destructiveness of an assault rifle, illegally modified.